Rooibos Body Lotion - Great for every type of skin. Rooibos Face Cream - With large amount of Alpha Hydroxy Acid and Zinc for healthy smooth skin. Rooibos Bath Salt - Dead Sea Salts with Rooibos. Luxuriate in the bathtab. Cleansing Beauty Bar, 5 oz - African Red Tea Cleansing & Beauty Bar is very rich, long lasting, and has excellent lathering ability. 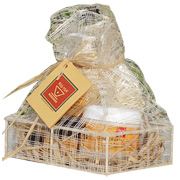 Rooibos Gift Pack 4 Items is shipped in a discrete, unmarked package. Orders are processed immediately and usually take about 3 to 5 working days to be received. We do ask that you try it for 2 to 3 weeks to feel the full effects. Any information received is used only for order processing and shipping purposes. Your information, such as e-mail address, will never be disclosed to a third party.